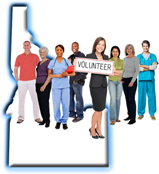 Volunteer Idaho is an electronic database of healthcare and non-healthcare persons interested in volunteering in a health-related capacity for emergencies or disasters (e.g., an earthquake, severe weather event, or public health emergency). Volunteers of all skill levels and backgrounds are needed during an emergency response. We invite you to register in Volunteer Idaho, whether you are a licensed and certified healthcare provider, an administrative specialist, a retired professional, or an individual with an interest in helping your community in a health-related capacity to a disaster. During the online registration process, you will be asked to enter contact information, active licenses or certifications, and other relevant background data. In the registration process, you will be provided an opportunity to indicate at what geographic level (i.e., local, state, national) you would consider volunteering. Registration in the system does not commit you to volunteering for an event. Once you’ve registered, your credentials will be validated. All information collected in this database will be confidential and considered private (non-public), security information under Idaho Code 9-340(B). The information will only be accessible to the Idaho Department of Health and Welfare, your District Health Department, and their federal, state, regional or local partners in planning, investigating, and controlling a public health emergency. Your information will only be viewed by authorized system managers. If you have already completed the registration process or wish to return to a registration which you’ve started but not completed, you can log in and update your profile. Upon completion of your registration, you will be contacted by either the Idaho Department of Health and Welfare or your local District Health Department. If you have questions related to this site, please e-mail kmonson@phd2.idaho.gov or call 208-799-0393. Thank you for your interest in volunteering!